Amongst the people who came to Martin’s celebration at St Botolph Aldgate on February 20th were present and past members of our team and people who have worked with us or for us over many years. 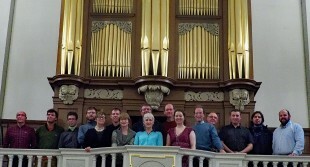 From left to right (front row) Margaret Hamilton (Martin’s partner), Emma Hagen (our administrator), Antonia Gwynn, Abigail Balfour, and (back row) Nigel Perry, James Collier, Peter Meier, Guillaume Zellner, Nick Hagen, Sergio del Campo Olaso, Dominic Gwynn, Edward Bennett, Malcolm Fisk, Stuart Dobbs, José Manuel Izquierdo König and Rob Rowley (Abigail’s fiancée). It was great to meet them all again, even if, in some cases, briefly.